FBI Edits Radical Islam Out of Anti-Terror Video Game: Who Is the Real ‘Puppet’? On a hot day in June, the grandson of a bank president took to the floor of the Senate to denounce the daughter of sharecroppers. “I feel compelled to rise on this issue to express, in the strongest terms, my opposition to the nomination of Janice Rogers Brown to the DC Circuit,” Senator Obama said. Born in segregated Alabama, Janice Rogers Brown had been a leftist like Obama before becoming conservative. When Obama rose to denounce the respected African-American jurist for her political views it had been almost a full two years since President Bush had nominated her in the summer of ’03. And he filibustered Judge Brown, along with other nominee, trying to deny them a vote. “She has equated altruism with communism. She equates even the most modest efforts to level life’s playing field with somehow inhibiting our liberty,” he fumed. When filibustering Justice Alito, Obama rejected the idea that the Senate should approve a judge just because he might be “intellectually capable and an all-around nice guy.” The key test was “ideology.” Justice Alito was an “an intelligent man and an accomplished jurist” who had the “the training and qualifications necessary to serve,” but he was from the wrong side of the political tracks. And Obama put party over country and radical ideology over party. It was all about politics. It was always about politics for Obama. Democrats and their media allies demand a prompt and immediate “up and down vote” on his nominee. But when Obama voted against Judge Priscilla Owen, despite her highest rating, Democrats had blocked her nomination for four years. That’s an entire presidential term. Owen was nominated by Bush in his first year in office. Despite being a moderate, Owen only got a full Senate vote during Bush’s second term. Obama had fought to filibuster her even though Owen was generally considered a moderate. Obama filibustered Judge William Pryor, who had replaced Judge William Steele, who had never even gotten a hearing as part of a process that also took four years from first nomination to confirmation. Bush had nominated Judge Pickering in ’01 and he was blocked in committee, falsely smeared as a racist and then filibustered by Senate Democrats to deny him the “up and down vote” that they are now busy clamoring for. After three years, Pickering gave up and was replaced by Wallace, who was also blocked by Senate Democrats for a year and denied a vote. Six years later, Bush was still trying with Judge Southwick who had served in Iraq. He was also denied an “up and down” vote until the end of 2007. And only Obama was supposed to be allowed to do that. By the time Senate Democrats finally approved a Bush nominee, a presidential term and a half had passed. Those numbers should put any of the current rhetoric about a “prompt process” and the right to an “up and down vote” to rest. If failing to move forward with a judicial nomination is a violation of the Constitution, then Obama and his political party were in violation of it under President Bush. If it isn’t, then they are shameless liars who will say anything to get their way. At their worst, Senate Democrats actually kept a judicial seat open for their choice, Judge Andre Davis, for Bush’s entire two terms in office, by blocking all Republican nominees on one pretext on another until Obama took office. The seat stayed open not for a year or two or even six, but for nine years. Senate Democrats have not only denied an “up and down vote” on Republican nominees for entire presidential terms, they have smeared them and destroyed their lives and even taken lives. Judge Miguel Estrada’s nomination was blocked for years because, according to a memo from Senator Durbin’s office, he was “Latino,” in an ugly campaign that helped lead to the suicide of his wife. These are the rules by which the Democratic Party had played when the shoe was on the other foot. And let’s not forget it. Obama’s approach on both sides of the table was purely partisan. He now speaks about the importance of avoiding partisanship in judicial nominations, but his history of rhetoric and deeds tells another story. The man in the White House is entitled to nominate only those judges he agrees with. But the Senate is equally entitled to approve them based on the same criteria. In the Senate, Obama approved judges based on partisan criteria. In the White House, he nominates judges based on partisan criteria. Both of these behaviors are symptoms of his political extremism and inability to compromise. But even more troubling, his argument that Republican presidents and senators may not act the way that he did represents yet another fundamental breakdown of political equality under the rule of law. Obama not only seeks to break the laws of the land, to make his own laws and then to demand that everyone abide by them, but he also wants a double standard in which these unique powers that he has claimed will be exclusive to his political movement. That goes beyond putting party ahead of country. It is the wholesale replacement of country with party and party with totalitarian ideology. 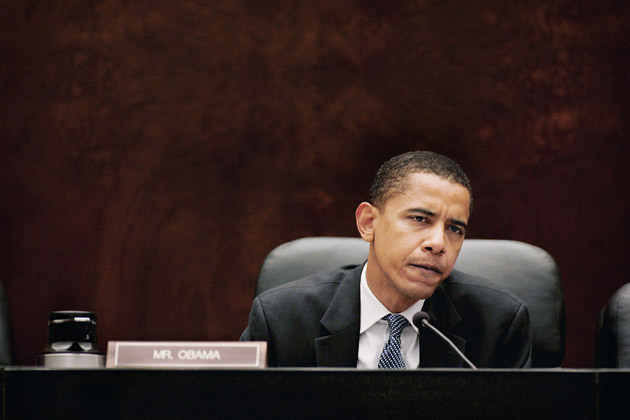 When he fought conservative judges based purely on ideology, Obama put party ahead of country. His judicial nominees were unqualified radicals who were manifestly hostile to the Constitution and put party ahead of country on the Supreme Court. Now Obama pleads with Republicans to put country ahead of party even while he schemes to once again find a way to put party ahead of country.